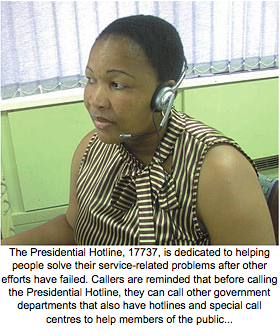 Special hotlines and call centres at government departments can help to reduce the high volume of calls directed to the Presidential Hotline. At these call centres, the particular departments can handle complaints directly. One such hotline is that of the Department of Rural Development and Land Reform. The department set up a special toll-free line to increase awareness of land rights and occupation security for people living on commercial farms. This hotline was set up during the launch of the Land Rights Awareness Campaign. It was started to make it easier for members of the public to get information and service from the department. The hotline can also be used to report any land rights abuse, particularly illegal evictions or other threats. This is a free service for people on commercial farms who cannot afford to make paid telephone calls when reporting incidents of illegal eviction, land rights violations and other problems related to their tenure security on farms. The call centre is situated at the national office of the Department of Rural Development and Land Reform. It has direct links to provincial offices and district offices. Callers are linked to these offices by the call centre agents who are fully trained to handle land rights and tenure security matters. The call centre, which can answer queries in all official languages, operates from Mondays to Fridays. Calls to the hotline can be made by farm workers, as well as anyone who witnesses or are aware of any land rights violations of any nature, including illegal eviction. The Department of Home Affairs has a call centre, as well as a dedicated hotline to the Minister of Home Affairs. The ministerial hotline enables the minister to attend to problems reported by members of the public after they tried to resolve them with other sections of the department. The ministerial hotline is operational every day of the week and has voice-recording facilities to allow members of the public to leave voice messages. It does not replace the department's normal call centre number, which continues to deal with queries from the public.